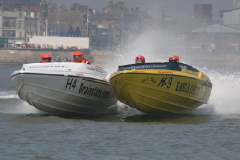 Formula 4-Stroke crews, both past and present, will be presented to visitors on the opening day of the Tullett Prebon London Boat Show on January 8. Following November’s announcement that the UK championship will be integrating into the Powerboat P1 World series program next year, its pilots will experience their first taste as ambassadors for the newly-branded Powerboat P1 SuperStock Championship. Hosted by current Powerboat P1 leading lady and former F4SA champion, Shelley Jory, who will be introducing the teams and proposing questions to some of the premier pilots, including the crew of the 225hp class Heights of Abraham, and 125hp class Hydrex, whose hulls will also be displayed on South Gallery stand SO63 throughout the show.